MAGNAFLOW CALIFORNIA CATALYTIC CONVERTERS carry a 5 year/ 50,000 mile warranty. To be completely filled out by installer and returned to manufacturer. Include dealer name, complete address and phone number. Include customer name, complete address and phone number. Vehicle make, year, model, engine size, mileage and date must be filled out. The part number installed must be filled out appropriately. The Installation Statement must be completed by installer, stating the reason for replacement. Vehicle owner and installer must sign and date the original Warranty Certificate/Installation Statement. 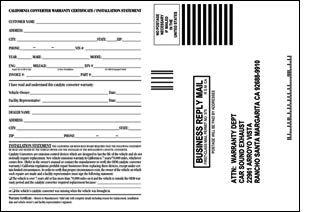 1) Installer’s Copy – Attach to invoice and retain for 4 years for California Air Resources Board inspection. Valid only with complete details including reason for replacement, installation date, and vehicle owner’s and facility representative’s signature. 2) Customer’s Copy – To be retained by the vehicle owner. 3) Manufacturer’s Copy – Warranty Certificate to be returned to manufacturer. Valid only with complete details including reason for replacement, installation date and vehicle owner’s and facility representative’s signature.